The modern home is not pristine. It's not perfectly balanced in asymmetrical form, in cookie-cutter shape and completely finished with everything built-in. It's what you make it and how you make it your own. The modern home is about finding the things that make it yours and connecting it back to you. Truly exceptional, the natural grey veining across the top immediately feels human and present. It's a grounding piece, in style and weight. As with any classic mid-century design piece, this Marble Tulip Table also brings home a sense of familiarity and confidence. Made to compliment its table counterpart, the Tulip Side Chair is similar in elegant, innovative design. Soft swivels and sloping curvatures move with you in natural flow. White and cream feel especially comforting amidst flush modernism. The first connection is finding harmony within the piece itself. 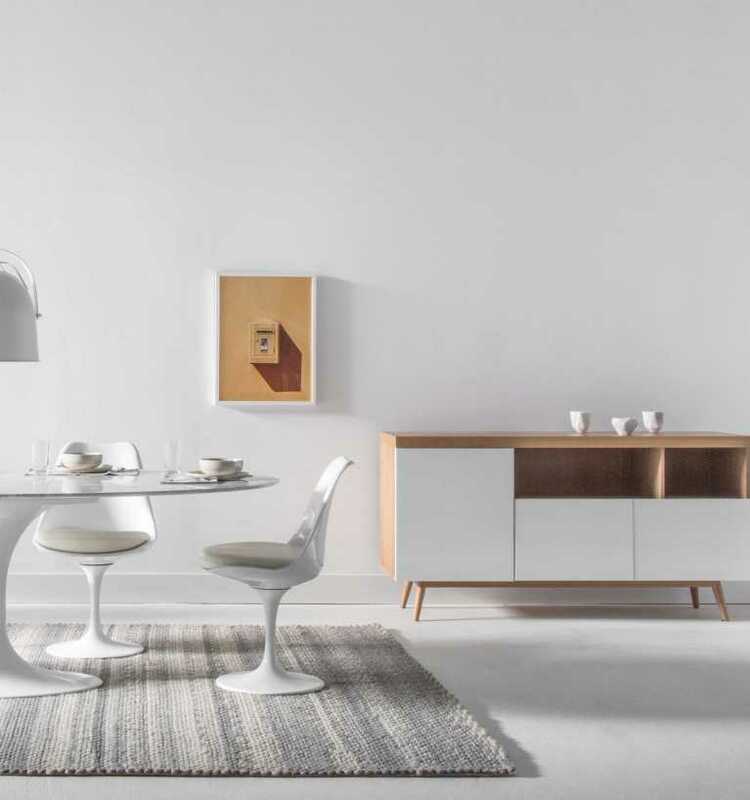 The Andrej Sideboard effortlessly blends natural warm wood with glossy white texture. It also redefines space with mixed open and closed compartmentalization. Handmade from the earth and painted with care, these warm grey ceramics hold every memory and desire you've had in the presence of your home. They are made for everyday use, and simply designed for years to have. Adjustable to the way you need it, this modest pendant is a generous spotlight to cast over you. Wesley's smooth matte metal shade is unquestionably simple, in a time and place when things have a tendency to often be too much. Giselle's two-toned beauty and vivid texture are reminiscent of nature's casualness and affinity. Hand-felted wool lends a medium heaviness to this modern rug, bringing warmth and comfort into your home. Find the things that make your home yours and connect it back to you. Click below to shop our other looks!